How do you like your pizza? Thin crust or deep pan? If you’ve been to a pizza restaurant in this country you’ll know you’ll be offered this choice between the two sorts of pizza. Italians for whom pizza is a national dish, also say that there are two sorts: the Italian sort and the sort made by the rest of the world! Now we’re not going to claim that our recipes are genuinely Italian but they are easy to make and delicious to eat. We have two recipes for the pizza base: one is for the traditional bread dough and the other is a scone-based recipe that is even quicker to make. Preheat the oven to 200oC, gas mark 6. Grease 1 or 2 baking sheets. Put the flour, yeast, sugar and salt into a bowl. Make a well in the middle and add the water and oil. Mix it to a soft dough that comes away from the edge of the bowl. Turn the dough out onto a floured surface and knead for about 10 minutes. Shape into 1 large circle or 2 smaller ones, and place on greased baking sheets. Spread with pizza tomato sauce, and add your chosen toppings (see below). For the traditional thin and crispy pizza, cook straightaway; for deep pan, leave it to rise in a warm place before cooking. It will take between 15 and 25 minutes to cook and it’s ready when the crust feels crispy when tapped. Pre-heat the oven to 220oC, gas mark 7. Grease a baking sheet. Sieve the flour and salt together into a bowl. Add the margarine, rubbing it into the flour with your finger-tips. As you’re doing that, try and lift you fingers high above the flour to get lots of air in and make the dough light. Make a well in the centre of the flour and pour in half the liquid. Using a flat-bladed knife, start mixing. When it’s beginning to stick together, use your hands to finish off, adding as much liquid as you need to make a soft but not sticky dough. Roll the dough out onto a floured surface until it’s about 1 cm thick. Transfer to the greased baking sheet. Spread with pizza tomato sauce, and add your chosen toppings (see below) and cook for about 15 minutes or until the dough is golden brown. You can buy jars of ready-made tomato sauce for pizzas but it’s cheaper and very simple to make it at home. Peel and crush the garlic. Empty the tomatoes into a saucepan and break them up with a fork. Add the rest of the ingredients. Bring to the boil, then turn down the heat so that the mixture simmers for about 30 minutes. And it’s ready to use. Cover pizza with thinly sliced mozzarella cheese, and drizzle a little olive oil over the top.When cooked sprinkle with parmesan cheese and scatter with torn basil leaves. For a truly authentic Margherita, use slices of tomato instead of the tomato sauce, and make sure the mozzarella comes from Italian water buffalo! By the way, did you know that this pizza took its name from Queen Margherita of Italy? In 1889, she visited a Pizzeria in Naples and the chef created a special pizza in her honour, in the colours of the new Italian flag: red (tomato), white (mozzarella) and green (basil). Top with prawns and tuna, and if you’re feeling adventurous, squid, mussels and scallops. Cover with slices of mozzarella. Grill some bacon rashers then cut into small pieces. Use as a topping along with bits of barbecued chicken (available from supermarkets) and salami. You can include sliced chilli peppers if you like it really hot! Top with sliced red pepper, red onion and drained canned sweet corn. Cover with grated cheddar or sliced mozzarella. Top with baked beans and frankfurters (or a tin of sausages and beans), and cover with grated cheddar. 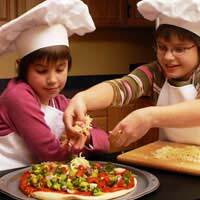 Once you’ve got the basics - the dough and sauce making - you can experiment and use any of your favourite vegetables, fish or meat: ham, bacon, pepperoni, courgettes, olives, anchovies. You could even try chocolate spread with chopped nuts for a sweet version. But remember to leave out the tomato sauce and cheese if you do that! Wow pizza turned out great I'm going to use this recipe all the time I don't think I'm ever going to buy a take away again !